When is Brake Repair necessary? When it comes to your car’s safety, brakes are at the top of the list of systems that need to be maintained. Worn brakes can cause longer stopping distances and difficult stopping in an emergency situation. Many people are not aware of the warning signs that indicate maintenance or brake repair may be needed. Grinding: A metallic grinding sound indicates your pads are worn through. Continued driving with this condition not only causes further damage, it is also dangerous. Squealing: A high pitch squeal noise heard at slow speed without pedal contact, means that the brake pads are down to the recommended wear replacement. There is a warning tab manufactured on the pad that rubs against the rotor to alert you. The noise usually goes away when the pedal is actuated. Low or Fading Brake Pedal: Do you pump your pedal to stop? Does the pedal sink to the floor when you’re stopped at a light? You could have a leak, and air in the brake lines or the master cylinder is leaking internally. Any of these symptoms need to be addressed as soon as possible. Remember to have your brakes checked any time you notice any of these conditions. At Dale Feste Automotive we have ASE technicians with the expertise and the proper diagnostic equipment to keep you and your family safe on the road. A squealing or grinding noise should be investigated immediately. Brake performance has improved in recent years, but a large percentage of vehicle’s are not checked regularly. 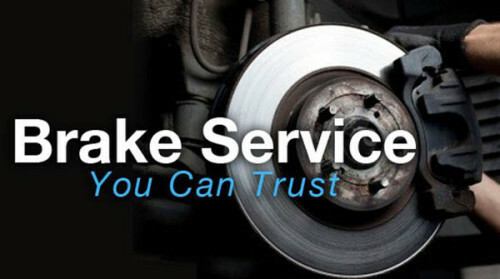 Brake repair work performed before you hear those squeals can save many dollars in repairs. Worn brake pads that begin to connect metal-to-metal can cause other damage and add extra dollars in brake repair. Evaluate the condition of the fluid. If the fluid absorbs moisture it will become acidic. This can lead to deterioration of seals, and damage ABS module on vehicles equipped with Anti Lock Brakes. Here at Dale Feste Automotive we take brake repair seriously so make an appointment today and let our experts get you back on the road fast!